I'm an artistically inept creative girl. I like the process of creating or constructing a vision. The problem is that I'm incapable of drawing a straight line without a ruler. Fortunately, there are other outlets for me to express my creative side, such as decorating or designing my own website. Sadly I failed miserably at the latter. When Printcopia first approached me to review their services I thought they were just another online business printing site. I was pleasantly surprised to learn they offered more than just business printing needs. 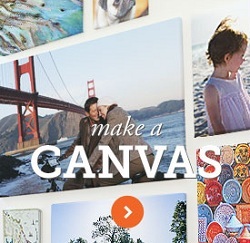 Printcopia turns your favorite photos or images into a work of art. They do this by using high-quality mediums and printing styles to bring out the best in your photos as well as making them look far more expensive than the actual cost. I had the opportunity to to choose an 8x10 canvas print. I have so many photos, but in the end I decided to go with an image I uploaded online. I couldn't be more pleased with the quality. The canvas appears to give the print a look of an authentic oil painting. It turned out beautifully and sadly my camera fails to really capture the depth of the painting, or the print. It does look very authentic. Using the Printcopia's design tool couldn't have been easier. Simply upload the photo and viola! your done. I'm having a harder time deciding on which room to display my painting. Makes for a wonderful gift with a personalized touch. That is regardless of being sent a sentimental image or giving the recipient the option of choosing their own photo. When it comes to images found or stored on the computer the sky's the limit. Personal photos, nature scenes, funny animal pics, and beautiful art. You also have the option to upload photos directly from Facebook and Instagram. I'm very pleased with the finished product. Standard shipping takes about two to three weeks. The item shipped nine days after the order was placed. So make sure you allot reasonable time for delivery. At the moment Printcopia is offering some fantastic deals including 50% off Canvas prints with free shipping. I learned that they offer a full selection of custom frames to get your prints ready for the wall. looking for a print for my kitchen that has a cup of coffee/etc. to signify an eating place. Printcopia uses non-toxic, eco-friendly inks. Printcopia can accept PNG, JPG, BMP and TIF files that are 20MB and under. The print will look great in my daughter's room because she already has a theme in mind. I think you should keep it in the living room! One of these prints would look great in our living room right above the fireplace! Thanks for the giveaway! I would choose a nature scene! I think I would choose a personal photo but there are several other photos that I have in mind as well. I like your print in the kitchen best. I would probably pick one of my nature shots. I would chose a personal photo of my two children. I would go with nature and in the family room for good color. I would choose a personal photo of my daughters. This picture would look great above the fireplace! I'd use a personal pic. I would choose a photo of my grandsons and hang it in my living room. I think it looks best in the kitchen. I would choose a personal photo.